Now that we’ve got your attention, find out how you can leverage the expertise of our multifaceted team of commercial real estate professionals. And learn some property search tips along the way! There is a vast difference between looking at just any commercial real estate available in Central Ohio and finding a property that checks off all of your boxes. Commercial real estate can be complex. Without an understanding of the market, industry, and community, you may find yourself lost in the woods without a map. Fortunately, you have a commercial real estate brokerage firm who has been a staple in the region available to help: The Robert Weiler Company. 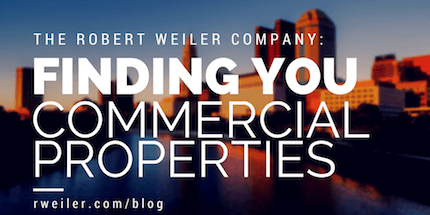 Established in 1938, The Robert Weiler Company is a group of experienced commercial real estate professionals specializing in all areas of CRE. Backed by 80 years in business, our local market knowledge and industry expertise provides a competitive advantage for clients interested in leasing, selling, or buying commercial property available in Central Ohio. Our commercial brokers and agents approach each assignment by formulating extensive analysis to facilitate the short- and long-term goals of the investors, property owners, landlords, and tenants we represent. We are committed to creating and maintaining strong relationships with our clients and keep their best interests at the forefront of all undertakings. Sales: Find commercial properties available on the market that are most suitable to your needs. Acquisition: Help you purchase your property at the best rate. Leasing: Develop and maintain a profit on your commercial real estate investment in the market. Commercial property search: What are you looking for and how can you purchase it? Real estate brokerage: Do you know the best approach to sales, acquisition, or leasing? Commercial appraisal: Are you getting the most value for your dollar? Real estate development services: How can you maximize your investment and the value of your property? Commercial property management: Do you have the capacity to run your investment once the property is up and running? Ready to See The Best Commercial Properties Available for Your Needs? At The Robert Weiler Company, our team focuses on more than just sales; our passion is in building a community in Central Ohio. When you come to us for your commercial property needs, you are partnering with a company that wants to work with you to not only grow your business, but also the entire community around you. Who better to be invested in your success than one of the most longest-standing commercial real estate companies in Columbus, Ohio? Call 614-221-4286 to start searching for commercial properties available today.